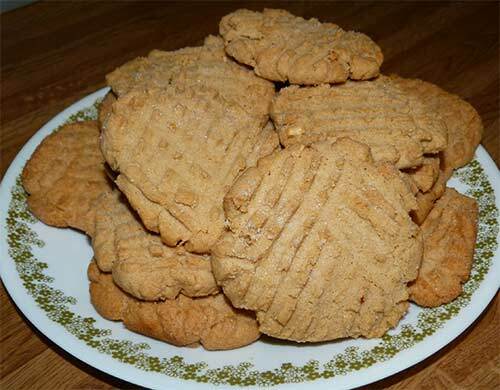 Here is another recipe using whole grain sorghum. 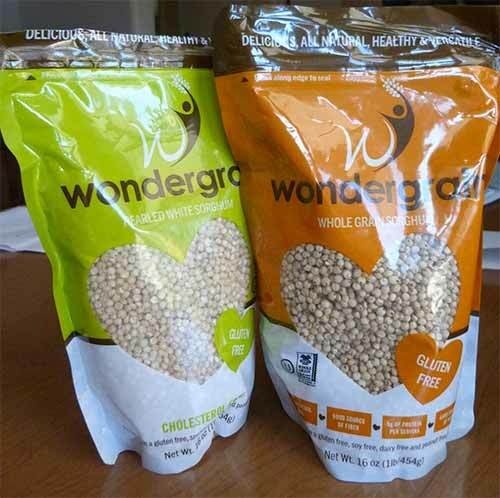 I found a new company called Wondergrain that sells whole grain sorghum online, so I decided to give them a try. Their prices seemed very reasonable. I used the pearled sorghum for this recipe, but you could you either one. The whole grain sorghum still has the bran on the outside and is a little chewier. The pearled sorghum is lighter and fluffier, more like white rice. 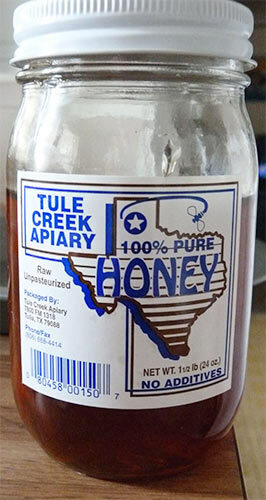 This is a new brand of whole grain sorghum I’m trying. I have swiss chard (which I LOVE) growing in my garden, so I used that instead of the cilantro called for in the original recipe. 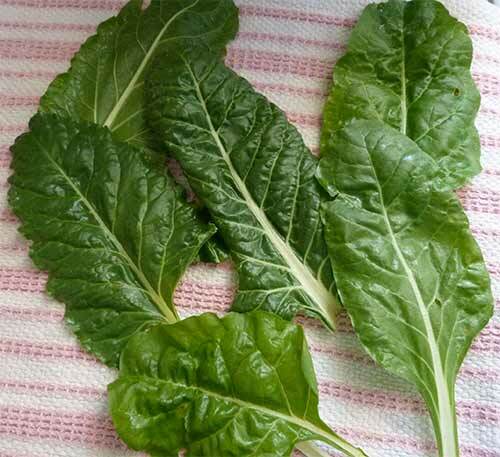 I used swiss chard from my garden instead of cilantro. 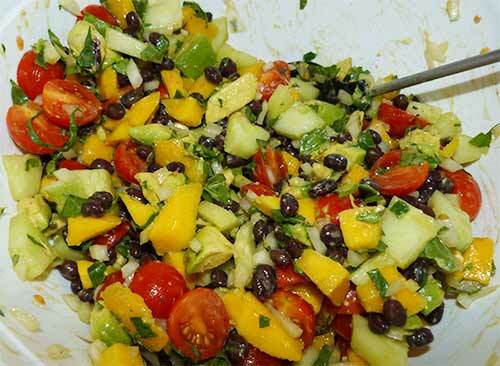 The lime juice and the mango in this salad make it very sweet, refreshing and light. You could eat this salad as a meal by itself or as a side dish. 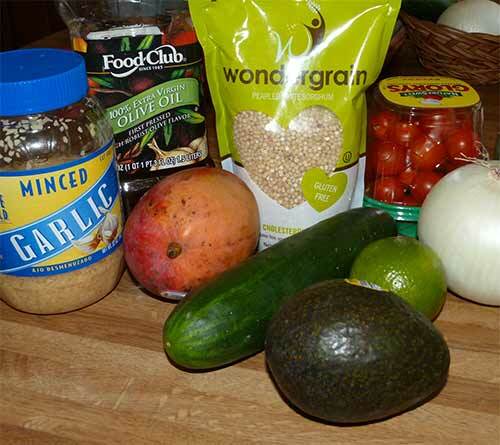 Ingredients for this salad, except for the swiss chard and the beans. I used about 3/4 cup of dry sorghum, which turned out to be about 1/2 cup too much after cooking. 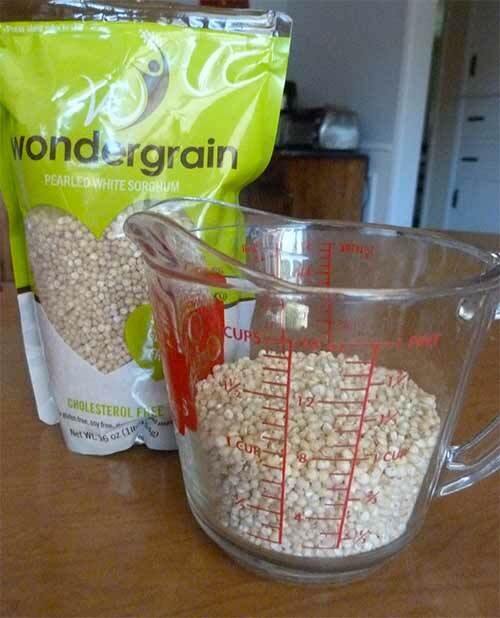 Soak whole grain sorghum 2-3 hours, then cook in 2 cups of water until soft and all water is absorbed – about one hour. After it is cooked, fluff the sorghum grains with a fork and set aside to cool. 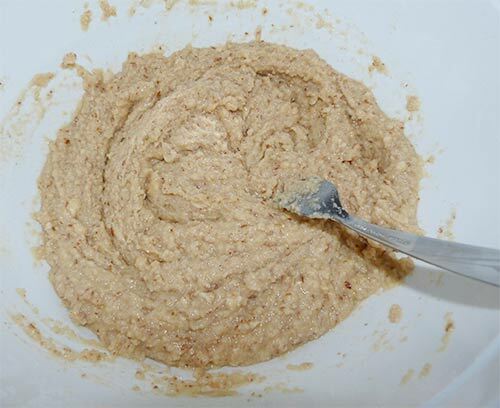 While the sorghum grains are cooling, mix the dressing in a small bowl and whisk well to combine. Mix together all of the fruit and vegetables in a large bowl. All vegetables and fruit chopped up and mixed together. 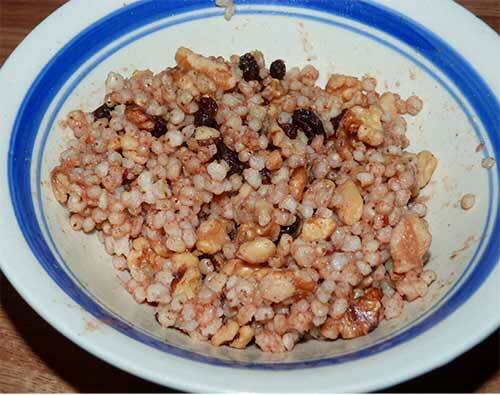 Once the whole grain sorghum is cooled, combine with other ingredients in large bowl. Pour the dressing over top the salad, and stir gently to evenly coat. Add salt and pepper to taste. Here it is after adding the cooked sorghum and the dressing. 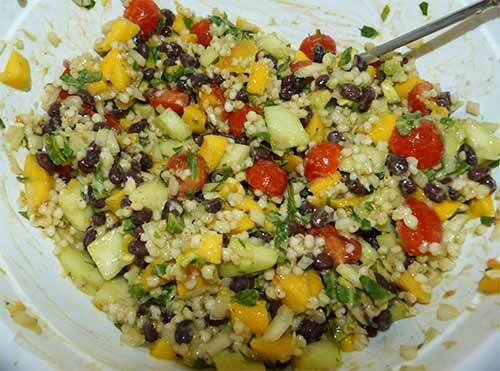 Chill in the refrigerator for 15 minutes or more so the sorghum grains can absorb the dressing a little bit. Since I had about 1/2 cup of cooked sorghum left over I decided to try it for breakfast. I warmed it up in the microwave and then added a teaspoon of honey, a few shakes of cinnamon and some raisins and walnuts. It was really good – and filling! Warmed up leftover sorghum for breakfast with cinnamon, honey, raisins and walnuts. I went for a RIDE in the car with Maizy and it was SO FUN! She made the window go down and I put my head out and SNIFFED everything. The wind blew all the GOOD SMELLS right into my nose! Humans first started to cultivate grains in the Neolithic period (beginning about 9500 BCE) in the Fertile Crescent in Western Asia, and it is likely that celiac disease did not occur before this time. It wasn’t until the 20th century that the cause of celiac disease was identified. In 250 A.D., Aretaeus of Cappadocia recorded a “malabsorptive syndrome with chronic diarrhoea.” When describing his patients he referred to them as “koiliakos,” which meant “suffering in the bowels.” The patient described in Aretaeus’ work had stomach pain and was atrophied, pale, feeble and incapable of work. The problem, Aretaeus believed, was a lack of heat in the stomach necessary to digest the food and a reduced ability to distribute the digestive products throughout the body, this incomplete digestion resulting in the diarrhea. Francis Adams translated these observations from Greek to English for the Sydenham Society of England in 1856. Adams gave the name “celiacs” or “coeliacs” to those suffering from this illness based on his studies of Aretaeus’ writings. In 1888, the pediatrician Samuel Gee presented clinical accounts of children and adults with celiac disease at the Great Ormond Street Hospital for Children in the United Kingdom. Gee stated, “to regulate the food is the main part of treatment. 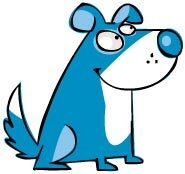 The allowance of farinaceous foods must be small, but if the patient can be cured at all, it must be by means of diet.” September 13th is designated National Celiac Disease Awareness Day in honor of Gee’s birthday. Christian Archibald Herter, an American physician, wrote a book in 1908 on children with celiac disease, which he called “intestinal infantilism.” He noted their growth was retarded and that fat was better tolerated than carbohydrate. The eponym Gee-Herter disease was sometimes used to acknowledge both contributions. Sidney V. Haas, an American pediatrician, reported positive effects of a diet of bananas in 1924. This diet remained in vogue until the actual cause of celiac disease was determined. Dutch pediatrician, Willem Karel Dicke, MD, was recognized in 1952 for linking the ingestion of wheat proteins as the cause of celiac disease. Dicke noticed that while there was a shortage of bread during the Dutch famine of 1944 there was a significant drop in the death rate among children affected by CD – from greater than 35% to essentially zero. He also reported that once wheat was again available after the famine, the mortality rate soared to previous levels. The link with the gluten component of wheat was made in 1952 by a team from Birmingham, England. Villous atrophy was described by British physician John W. Paulley in 1954 on samples taken at surgery. This paved the way for biopsy samples taken by endoscopy. The cause of celiac disease was eventually discovered to be an autoimmune reaction to gliadin, a gluten protein found in wheat, plus Secalin in rye and Hordein in barley. The lining of the small bowel is flattened, which interferes with the absorption of nutrients. 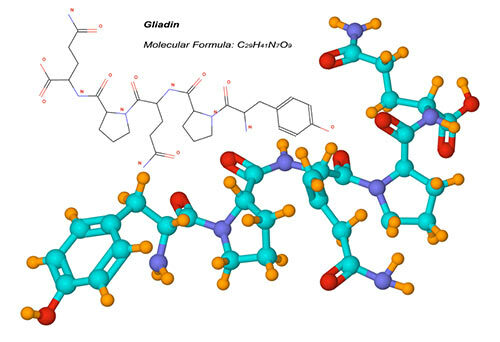 This gliadin molecule, found in wheat, is one of the triggers for the immune system reaction that causes celiac disease. Originally called non-tropical sprue, terminology changed as research confirmed the adult sprue was the same thing as celiac disease diagnosed in children. The term “celiac disease” is now most commonly used. Another term for the same condition includes “gluten sensitive enteropathy.” Dermatitis herpetiformis and gluten ataxia are generally considered specific manifestations of celiac disease. I’m very grateful to all of those who worked so hard through the years to find this disease and determine the treatment! I LOVE my toys. I like to get them ALL out and arrange them around the den JUST RIGHT. Then Maizy puts them all BACK in the toy place again. We play this fun game nearly EVERY day. I’m such a LUCKY dog! Lemon cake is always good in the summertime. I was intrigued by the use of olive oil in this recipe. I’ve never used olive oil in baking, so it was a fun experiment. It turned out amazing, although not as pretty as the photos from site where I got the recipe. I don’t have a springform pan, so I used a regular 9” x 9” square cake pan. When I turned it out of the pan the cake broke in half. I think I didn’t let it cool long enough. I pushed it back together and it looked ok after glazing and putting on the almonds. 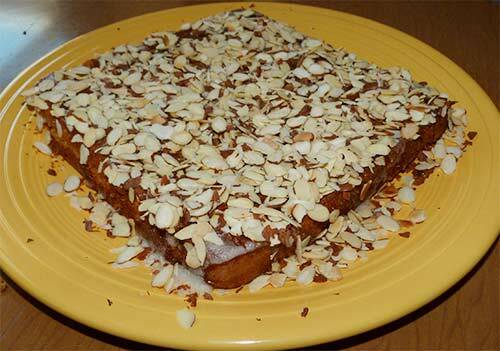 Finished cake on platter with glaze and almonds. I forgot to take photos until the very end, so there’s not one of the batter. It was very runny and I was concerned that it wouldn’t cook all the way. But it came out great – very moist – although it didn’t rise very much, if any. 1. Preheat the oven to 350°F and have the rack in the center. Grease and flour a 9-inch springform pan or cake pan. 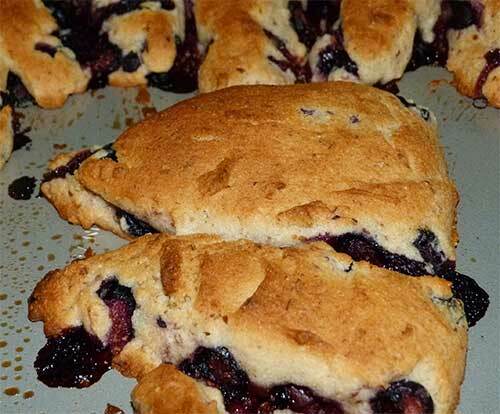 I used some white rice flour here, but you could use any light, gluten-free flour. 2. 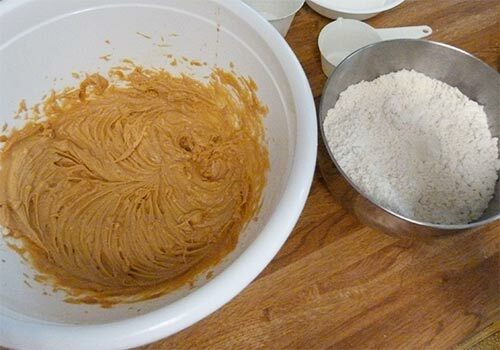 Whisk together the sorghum flour, almond flour, baking powder and salt until combined; set aside. 3. In separate bowl, whisk the eggs to break up the yolks. 4. 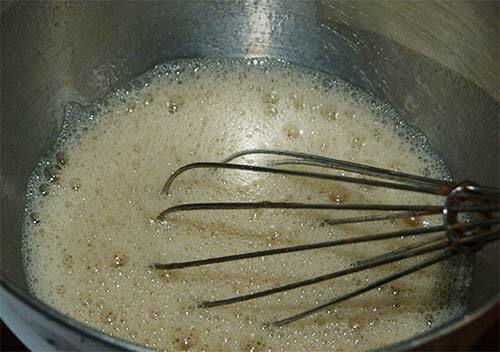 Add the sugar and whisk for about 30 seconds. 5. Add the olive oil and whisk until the mixture is thoroughly mixed, about 45 seconds. 6. Add in the extracts and zest, followed by the orange juice and mix thoroughly. 7. 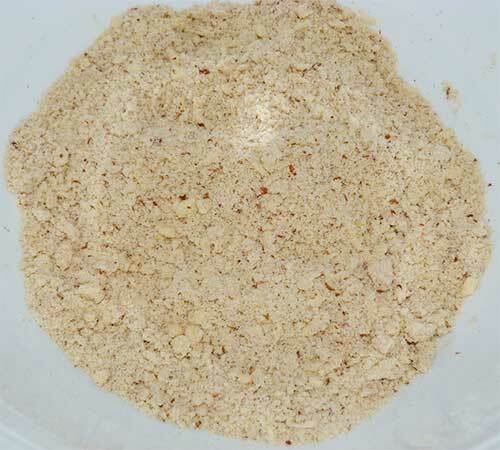 Add the dry ingredients to the bowl and stir until combined. 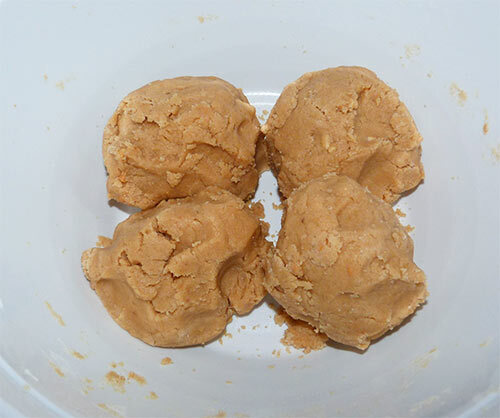 Continue stirring until you have a smooth, batter, about 30 more seconds. 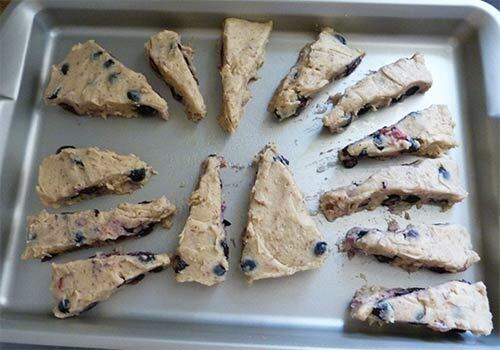 Batter will seem runny compared to many other gluten-free cakes. 8. Pour the batter into the cake pan and shake the pan a little to get out any bubbles. 9. Bake on center rack for 30-45 minutes or until the cake has come away from the sides of the pan. The cake should bounce back if you touch it lightly. 1. Melt the butter over medium heat and let it brown slightly. 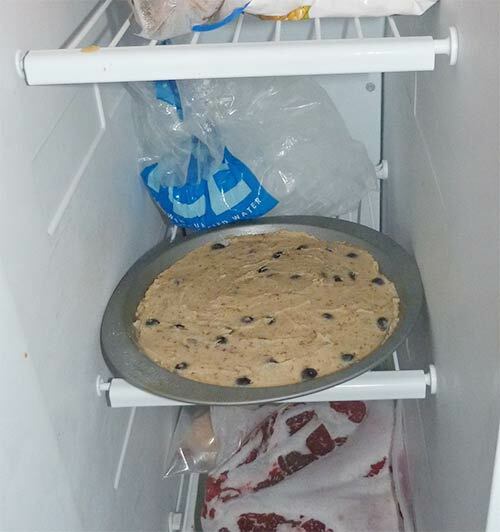 Put it aside to cool. 2. 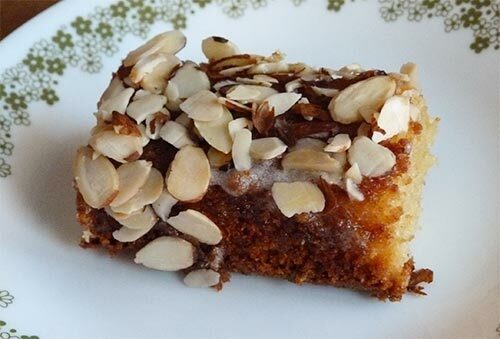 Sift the confectioner’s sugar into a bowl and stir in the milk until smooth and creamy. 3. Stir in the butter until mixed. 4. Add a few drops of lemon juice. Should be about 2 or 3 drops. 1. Spread the glaze onto the cake. 2. 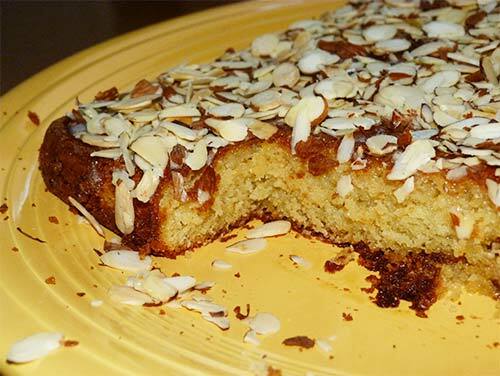 Spread the toasted almonds on top of the cake. 3. Ready to serve when glaze is set. The cake was very moist inside. Adapted from Elle Kirschenbaum’s Torta di Mandorle e Limone. Maizy spilled some ALMONDS on the floor and I helped her clean them up. Mmmmm! I LOVE helping in the kitchen! It took me a little while after I was diagnosed with celiac disease to figure out what questions to ask at restaurants. I felt really self-conscious asking at first, but it got easier each time. How do you explain to a restaurant that you’re gluten-free? Telling your server is an important first step, but it can also help to have a resource to make sure that the restaurant understands how to proceed once you make that gluten-free request. The NFCA has a free tip sheet to help you dine out safely. The tip sheet walks you through a number of important questions that can help you determine if a restaurant is properly prepared to meet your gluten-free needs. This guide cannot guarantee a safe meal, but it can help you feel more confident and comfortable when speaking with the staff about their gluten-free options. On the right hand side of the sheet, there is a slip you can sign, tear off and leave with the restaurant to recommend that they get gluten-free training. Can you tell me what gluten is? What are your gluten-free menu options? Have you completed a gluten-free training program, such as GREAT Kitchens? Do you use any spice blends or mixes? Do you use four or soy sauce in the dressing/sauce/batter/base? How do you top/garnish the dish (i.e. 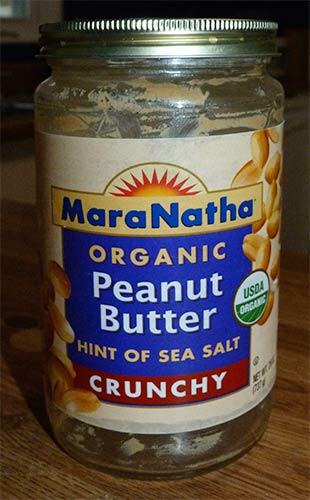 croutons, fried onions, crackers)? Do you use a separate prep space for gluten-free food? 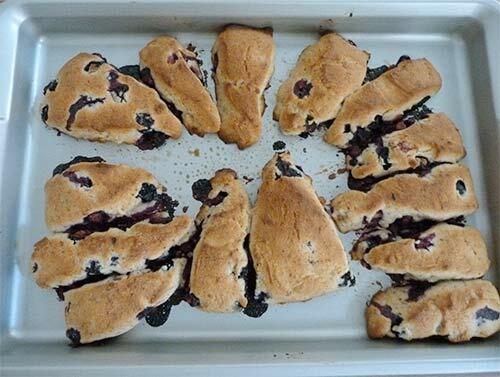 Do you use separate cookware and utensils for gluten-free food? Do you clean the grill? Do you use a dedicated fryer? Ask to speak to the manager or chef. Explain that you have celiac disease and will get sick from traces of gluten. Relay the facts of your experience, including relevant details. It is possible to dine out safely if you have celiac disease. 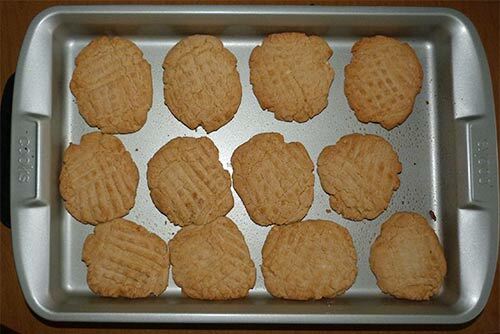 But it’s important for you to be proactive about learning everything you can about your gluten-free diet and making sure those preparing your food understand, as well. Eat well and be healthy! Maizy has those red things in the garden again that I LOVE! She calls them tomatoes. I call them YUMMY! When she picks them I always give her my CUTEST cute doggy look and then I get to EAT one! I’ve been doing a little research lately on how intestinal flora affects digestive health. This can be especially important for people with celiac disease, who already have damage to the digestive system. Studies suggest increasing the beneficial gut bacteria through the use of gluten-free probiotics and prebiotics can help reduce the inflammation caused by celiac disease. Intestinal flora, the beneficial bacteria on the lining of your intestine and colon, play a major role in the digestion of food. Probiotics perform a significant role in re-establishing the intestinal flora and maintaining good overall health. Prebiotics are found in certain foods, are not easily digested and enhance the growth of the good bacteria in your colon. The gluten-free diet typically lacks an abundance of prebiotics. A patient with celiac disease has a deficiency of good bacteria, so probiotics and prebiotics should be an important part of treatment. Intestinal flora fights against the inflammation developed in celiac disease, according to the “American Journal of Gastroenterology.” Therefore, restoring that flora should be a prime concern during treatment and rehabilitation. There are a lot of benefits of using probiotics if you have celiac disease. Probiotics not only provide nourishment to the intestinal flora, they also furnish vitamin K and biotin, which are essential for good health. Probiotics reduce the absorption of heavy metals and give protection against toxins produced by harmful bacteria in your gut. Probiotics can help prevent bad bacteria from sticking to the walls of your intestines. 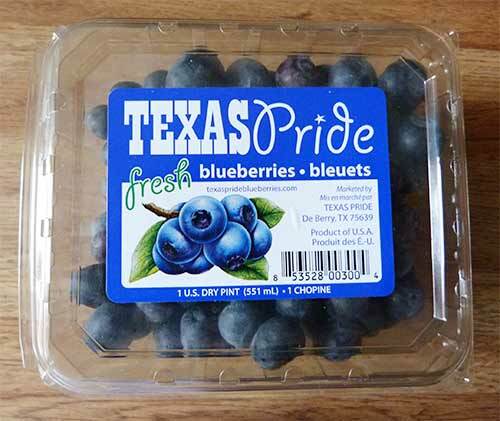 They improve the absorption of essential nutrients, which is severely impaired due to celiac disease. Together, probiotics and prebiotics restore the normal movement of the gut that gets distorted in celiac patients. If you take antibiotics, make sure to replace the probiotics with a supplement or in your diet. Be kind to your good bugs! I ate a bug today. I CHASED it around the yard, then I CAUGHT it, then I ATE it! … then I got sick in the house and Maizy made me go back outside … It must have been a BAD BUG!